Dr Nana Hagan, from Korle-Bu teaching hospital, Accra, Ghana has arrived at Ganga Hospital, Coimbatore for Microsurgery training and 3 months surgical placement. Microsurgery is a vital surgical field in reconstructive plastic surgery. During his stay Dr Hagan will attend a live surgery workshop and hand conference. 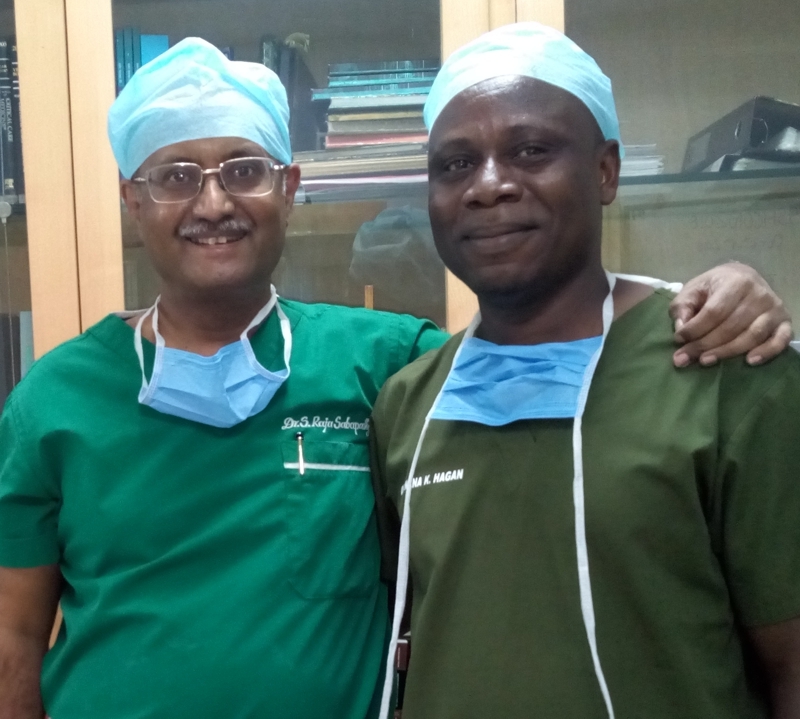 ReSurge Africa wishes Dr Hagan a productive, educational and interesting stay in India and our sincere thanks as always to our partner Ganga Hospital, its hard working team and Professor Raja Sabapathy (pictured here on left) for his ongoing support. Professor Sabapathy has contributed hugely to the success of the ReSurge Africa training programme and been an inspiration to many trainees. We are very grateful for his generous mentoring skills. Surgeons, Anaesthetists, Nurses and Physiotherapist trainees have all benefitted from the excellent work ethic of Ganga Hospital staff and will carry those leadership skills throughout their own careers.